An eclectic, bohemian vibe. Rather than simply sticking to solid colors for cushions and pillows, opt for prints and patterns that evoke an exotic feel. Just as a world traveler collects souvenirs from every place that they visit, you can give your patio space a more well-traveled feel by bringing in bold colors and repetitive patterns. Combine bright colors with more Earthy, neutral tones like beige, tan, and brown. Wood and wicker pieces that have a weathered look are favored over more perfect and pristine materials. Think of colors and tones that evoke nature, such as soft, sandy beaches, and gardens rich in foliage. The furniture frame itself will look subtle, but will really be brought out by the bold colors on the cushions, pillows, and other accents. The patio as an extension of the home. You want your patio to feel like an extension of your indoor living space. Choose furnishings that fit well, but that also allow you to create a place to dine and relax. A small, simple bistro table with chairs made from wood can be dressed up with colorful seat cushions and place mats. Rattan and wicker sofas, loungers, and tables provide the perfect place for kicking back and enjoying a drink or two. For 2016, homeowners want the outdoors to feel like a seamless extension of the interior where they can unwind and entertain with ease. At the same time, this space can evoke the feeling of an escape to a more tropical locale with the right decor and colors. Patio furniture is the simplest way to give your outdoor space a fresh look. Trending styles will allow you to create an exotic escape right in your own backyard. Don’t be afraid to mix vivid colors and bold patterns to achieve a beautiful space for dining, relaxing, and entertaining. Winter can bring a joyful break from mowing every week, but don’t forget about your landscaping all winter long. Here are a few mid-winter tips for keeping your lawn healthy during the winter season. Clean up: Leaving debris and leaves on your lawn during winter is extremely detrimental. It will smother your grass and can create disease and invite insects and mice. When an object is left on the grass during winter and snow fall, it creates dead patches in your grass from the weight on the object. Quickly rake away any dead leaves and pick up all backyard toys during these cold weather months. Avoid Excessive Traffic: The grass under the snow can tolerate a moderate amount of traffic. A lot of traffic will make your grass have a harder time recovering during the spring. Avoid walking on your lawn frequently. This can compact and kill the grass. And avoid parking cars and trucks on your lawn during the winter as well. Even a small, compact car can kill your grass that is under the tires. Using your lawn for parking may kill your grass for good. Level Out The Snow: When your lawn is covered by heavy snow for a long period of time, mold can attack the grass. The disease can grow under layers of snow during the winter. You can prevent mold by simply spreading out the large snow piles. Take an extra few minutes and evenly distribute the snow out on your lawn. Don’t have time for these winter landscaping tasks? Call us today for snow and winter maintenance! 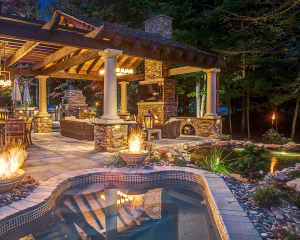 You’ve heard it many times before that your outdoor living area should be an extension of your indoor living space. 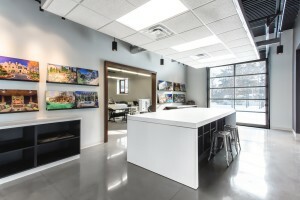 Yet how do you transfer your interior style to your backyard when the elements you choose must be able to withstand all types of weather while also blending into landscaping? Obviously, you’ll want weather-friendly furniture with mildew- and mold-resistant fabrics that also won’t fade when exposed to the sun. Frames should also be resistant to rust. The first of several tips to bring your interior style to the outdoors is to define the mood and personality of your interior scheme. Is it modern, traditional, bold, or soft and cozy? After determining this element, you can select outdoor furniture that will continue your theme. Take your time selecting pieces to make sure that the colors and fabrics will blend seamlessly from indoors to outdoors. Accent pieces are just as important in an outdoor setting as they are indoors. Carefully choose accent tables, making sure that they are weather-proof. Decorative throw pillows in light colors add comfort and help furniture portray a relaxed and comfortable feeling. Outdoor area rugs can also give an outdoor living and dining area a homey feel. Instead of traditional concrete, consider natural stone tiles for a warmer look. Lighting is another crucial aspect. Cleverly-hung outdoor fixtures can create a welcoming and decorative atmosphere. For covered areas, you can also consider table lamps to set a mood during any gathering. 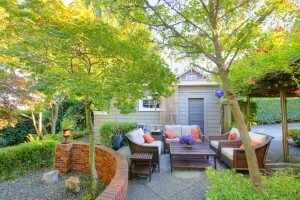 Landscaping can play an interesting role in creating atmosphere for your outdoor living space. Use bushes and small trees to create living barriers that will create walls to define the area and keep out prying eyes. Place potted plants in strategic areas if you include normally include greenery in indoor decor. Use greenery in unique ways like incorporating climbing vines on latticework or on a pergola for additional splashes of color. An outdoor kitchen will go a long way toward emulating your indoor living space as kitchens always act as gathering places. Such an area will also allow you to prepare and serve food to guests with much less effort, leaving more time for socialization. 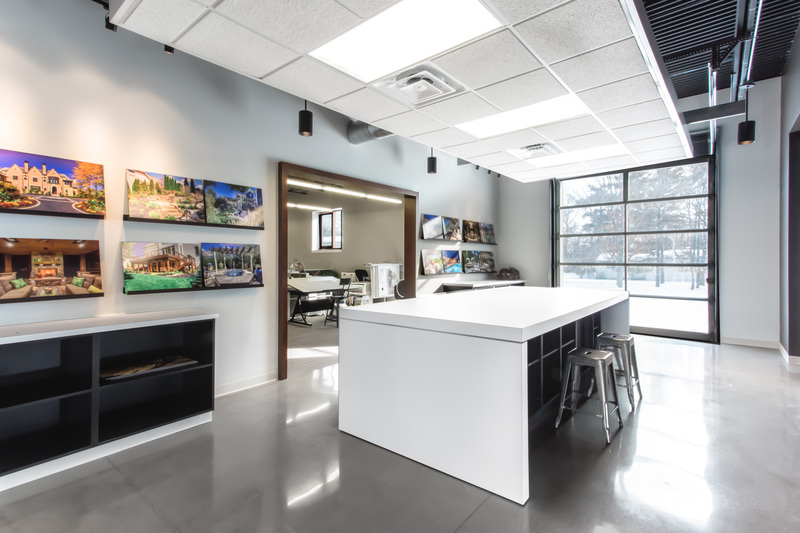 It’s a New Year, and with the New Year comes desires for many new things, such as a new you, a new home, and even new landscaping and outdoors designs. Check out these exciting ideas for transforming your landscaping into a new yard or outdoor space in 2016. Sustainability. 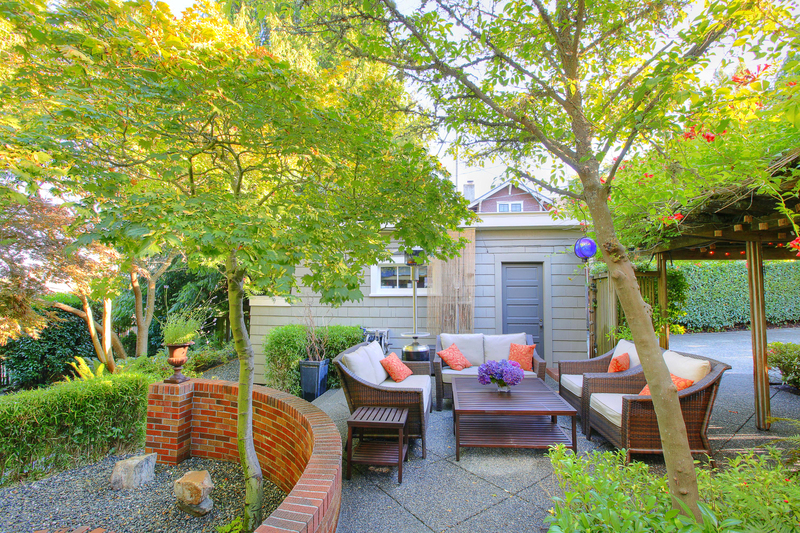 A recent, but growing, trend in landscaping is low maintenance sustainability. With this goal in mind, utilizing drought-resistant plants and shrubs while less grass can not only decrease the amount of water required, but it can be less expensive over time and provide you with more free time. The good news is that low-maintenance and drought-resistant plants do not sacrifice aesthetics. Many lend themselves well to gorgeous landscaping designs. Edibles as Aesthetics. In the past, most people have kept their aesthetic and edible plants separated, with the aesthetics at the forefront of their landscaping design. Suddenly, edibles have moved their way to the front of many gardens, in plain sight. These blended gardens not only provide beautiful landscaping, but they also provide a harvest of fruit, vegetables, and herbs. These types of gardens are also ideal, as they can give a bountiful resource for many communities. Quality Over Bling. Big showy landscapes are becoming so last year. Homeowners are now leaning towards quality materials that are natural and long-lasting. Good landscaping designs will incorporate scale and be more about practicality and longevity than trendy. Natural stone and wood elements are popular in many landscaping and outdoor designs. Water is Always in. 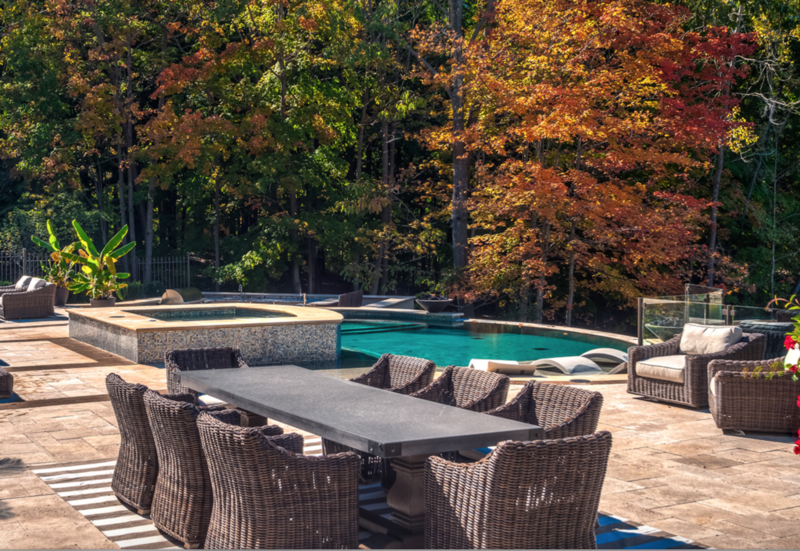 Water continues to be one of the biggest landscaping trends of 2016. While the way we work with water and the way it is used and displayed will change over time, using water in a landscaping design has stood the test of time. Self-contained water systems are now eco-friendly and inexpensive. Landscaping designs that feature water can fit nearly any budget; from a simple urn or fountain to a custom built waterfall or even a water wall. Going Green. 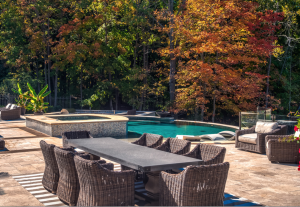 In addition to landscaping that requires less water and maintenance, outdoor landscaping trends now include outdoor spaces that do not require major regrading of the existing or natural land and the construction of retaining walls. This allows for a more natural look and feels and makes a home more eco-friendly than a conventional backyard. Decks and outdoor spaces can be built into the natural grading of the land, making for an eye-catching design.